There is no shortage of winners when it comes to this month's surprising ascent of basketball star Jeremy Lin. The suddenly hot New York Knicks point guard found his way into the starting lineup due to ill luck on the part of his teammates, but has delivered in a way that has drawn a lot of welcome attention to the league, team, and player. Madison Square Garden (MSG) has been the obvious winner. The publicly traded company owns the Knicks, the venue where the previously hapless team plays, and the MSG sports network that broadcasts its games. The loser -- until recently -- has been Time Warner Cable (TWC). The regional cable provider failed to negotiate a renewal for its deal with MSG in December, so the roughly 2 million Time Warner subscribers in the New York area weren't able to watch the birth of Linsanity. 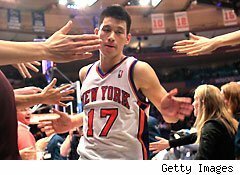 As ratings for MSG's sports channel soared 130% through early February when Lin led his team on a Lincredible winning streak, Time Warner Cable subscribers had no choice but to fume -- and many likely canceled the cable service in favor of providers that could offer the Knicks. Time Warner Cable's latest quarter may not seem all that worrisome. Revenue climbed 4% to $5 billion, and adjusted operating income before depreciation and amortization grew slightly better than that. However, a good chunk of that comes from the company's business services. It's a fast-growing segment for Time Warner Cable, but it represents just 8% of the total revenue mix. Residential service revenue actually grew by just 2.6%, and that was nearly entirely the handiwork of the company's Internet access and Web-based phone service. Video revenue was flat and advertising revenue declined by 10%. Why is ad revenue diminishing? Well, folks just aren't watching television the way they used to given the popularity of streaming video alternatives, DVRs, and on-demand presentations. Advertisers know that. However, let's dig deeper into the flat revenue on the video side. The lack of growth may signal a lull, but it's worse than that. Time Warner Cable -- like most satellite television and cable providers -- is simply increasing its rates. It's not necessarily greed on its part. Satellite and cable providers have to pay more for the channels that they're carrying, even if consumers would prefer to cherry-pick the channels that they actually watch. Cable companies have also been upgrading their equipment to herd viewers into costlier packages and equipment rentals. And it's not as if Time Warner's Cable audience is actually growing on the video front. The cable giant closed out the year with 11,889,000 subscribers, or 50,000 fewer accounts than just three months earlier. Go back to the 12.257 million subscribers it had at the beginning of the year, and we're looking at a loss of 368,000 video accounts in 2011. It lost 602,000 more video subscribers than it gained in 2010, and that was after shaking off 210,000 net subs in 2009. In a nutshell, you're looking at a company that has either priced or inconvenienced its way out of nearly 1.2 million net homes over the past three years. Three years ago, Time Warner Cable had more than 13 million video customers. Where have all of the couch potatoes gone? How low do you think that number will be next quarter, even now that the MSG sports network matter has been remedied? Cable providers love the triple play. Bundling video, Internet, and home phone service into a single package helps the companies provide some price breaks to consumers as it makes the most of its cabling investment. However, we're seeing a growing number of consumers ditching the costliest component of their service: video. They're making do with high-def antennas for free local content and tacking on video streaming services. Meanwhile you have hungry telcos. AT&T (T) and Verizon (VZ) have seen cable providers eat into their fading landline businesses. AT&T and Verizon also happen to be the country's two largest wireless carriers -- so their fingerprints are all over the demise of the traditional corded phone -- but now they're attacking cable companies by offering their own TV platforms. AT&T's U-verse and Verizon's FiOS are growing at the expense of regional cable companies for those who are still willing to pay for a ton of channels. Nor is that the full extent of the competition. Google (GOOG) is in the process of installing ultrafast Internet connectivity through Kansas City. Its Google Fiber subsidiary has just filed applications in Kansas and Missouri to begin offering a video service on top of its speedy online access. If successful, you just know that Google's going to go national. Analysts are generally upbeat about the future. They see revenue climbing nearly 5% this year, and by another 3.5% come 2013. They see earnings growing even faster, but Wall Street has been overly optimistic with Time Warner Cable before. The cable juggernaut has missed analyst profit targets in two of its past four quarters. Television is a $150 billion industry once you factor in monthly subscriptions and advertising, but there are plenty of companies vying for a slice -- or a thicker slice -- of the pie. And let's not forget about Apple (AAPL), which is widely expected to introduce a high-def television as early as this year. It would be a missed opportunity if Apple doesn't offer its own iOS-based television service with the launch. Investors could wait until Time Warner Cable prices its way out of most homes or infuriates the last of its subscribers, but the only safe place to watch this play out is on the sidelines. Longtime Motley Fool contributor Rick Munarriz does not own shares in any of the stocks in this article. The Motley Fool owns shares of Apple, Madison Square Garden, and Google. Motley Fool newsletter services have recommended buying shares of Apple and Google. Motley Fool newsletter services have recommended creating a bull call spread position in Apple.